"In Pursuit of the Perfectly Passive"
Our friends at BarlisWedlick Architects emailed to let us know an article on Dennis Wedlick was in the Thursday Home Section of The New York Times. The article, "In Pursuit of the Perfectly Passive, by Anne Raver, is an informative look at passive houses revealed through the charming personal story of how "two guys from the city," Dennis and his life partner, Curt DeVito, purchased an 11-acre property of "old farm fields and woodland" some 25 years ago (with the help of their parents); how they then built a small 1,000-square-foot, passive-solar cottage on the land; and how over time the tall pines, the meadow and the turkeys, the frogs and the Cattails of this beloved home have informed their lives and Dennis Wedlick's sustainable architecture. KR+H's work is in the newly published Classic & Modern: Signature Styles by architects Alan Barlis and Dennis Wedlick. We're delighted to be a part of both this firm's work and the book, which presents fourteen stories of homes designed by BarlisWedlick Architects. Each story illuminates how the practice of good design can successfully embrace "one-of-a-kind styles derived from the personalities, tastes and narratives of those that live within." In Classic & Modern: Signature Styles, Dennis Wedlick explains, "The goal of the book is to inspire others to discover their own signature style. 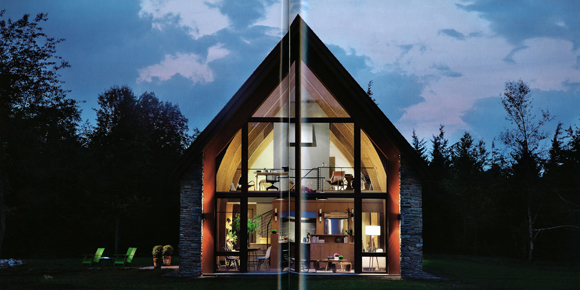 The examples in this book reveal not only the expressive art of architecture but also the importance of creating a "good home" — one that is based on the principles of good design, has character, blends comfort with practicality and is sensitive to it's environment." In meeting a new client, Dennis "wonders what their signature style might be: Are they minimalists at heart or the more romantic type? Would they be most comfortable in clean, crisp, modern spaces filled with natural light or classic rooms filled with texture and history?" Dennis finds that "More often than not, people's personal style is often a bit of both. Most people are attracted to various qualities of different architectural styles and cannot easily be defined as minimalist or romantic, modern or classic." As the book's website explains it, "...when homeowners are empowered to identify their personal sense of style - while also understanding the underpinnings of good design - they become full participants in the creation of their own one-of-a-kind homes. This is how signature style is born." "ECO: STYLE MEETS CRAFTSMANSHIP & STEWARDSHIP"
"ECO" is the story of the home where KR+H's craftsmanship resides. This home has also received acclaim as "The Hudson Passive Project." The book notes that "It is credited as being the highest performing passively heated and cooled house in the nation." We love that it is not only sensitive to our environment but also employs the art of architecture and craftsmanship that can so directly sustain us in our home life. Outside view of this passive home where KR+H's craftsmanship resides. Paul worked with Dennis Wedlick on the design of the kitchen which is a centerpoint to the home. View of kitchen and living room from the loft. KR+H's millwork and cabinetry provides both a partition and storage in the loft bedroom and media areas. Beyond "Eco," the range of stories in Classic & Modern: Signature Stylesis far reaching. "'The Minimalist,' for example, tells the story of avant-garde artist Marina Abramovic and her interpretation of a modern loft in the heart of New York City." In "Part I: Signature Modern, " along with "Eco" and "Minimalist," there are stories of "Rural," "Rustic," "Organic," and "Retro." "Part II: Signature Classic," includes "Revival," "Stick," "Colonial," "Cottage," "Shingle," and "Neoclassic." Throughout, there is a fresh look at Classic and Modern; often the boundaries are blurred. As Paul [Reidt] remarked, "The categories of style are as varied as the clients. And it's a look at architecture that isn't about the architects who become our heroes for their singular style but about the critically important and significant number of architects who extend, expand, improve on the design yet are always focused on their customers' varied and often remarkable ideas for the homes they live in." "...the underpinning fundamentals of good design have always been constant: Proportion, Scale and Light. Understanding how to establish the most pleasing relationships for these essential qualities creates the framework that allows all other choices to fall more easily into place." Thank you Alan Barlis and Dennis Wedlick for sharing your passion. Your writing offers a vibrant and endearing viewpoint that both deepens and broadens our understanding of how the fundamentals of good design can walk hand-in-hand with signature style. Paul received a copy of the book with this note: "We love what you do for us!" And in Dennis' afterward he includes a thanks to Paul. We really appreciate the thoughtfulness! 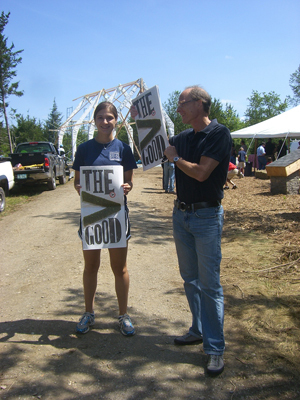 Another celebraton for all the people involved in the Hudson Passive Project! 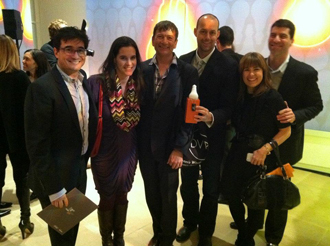 Dennis Wedlick and company accepted the BOY Award from Interior Design Magazine for the Best Green Project of the year. As Dennis wrote, "This is truly an outstanding achievement, especially because our little Claverack House was up against a number of prestigious projects from around the world and this proves that going green can be beautiful." Dennis thanked all the people who made this house award winning. For KR+H it was a wonderful collaboration, and there is a sustainable appreciation for the Hudson Passive Project and the people who embraced it. Congratulations to All! The Hudson Passive Project has landed on the pages of Interior Design Magazine. You can view the online story by clicking this link: INTERIOR DESIGN. It includes a great slide show of images by Peter Aaron/ESTO Photographics. Congratulations Dennis Wedlick Architect! And congratulations to all the contributors of the Hudson Passive Project. See our blog posts of December 4, 2010, to read more about The Hudson Passive Project. A small house is under construction near Hudson, New York, that is the tangible outcome of some very big ideas. Designed by Dennis Wedlick, this house presents solutions to the economic and environmental problems that have left the housing industry as crippled as a Hummer out of gas. The Hudson Passive project achieves three ambitious goals, all accomplished through art and craft. First, and perhaps most importantly, this is a green house that will require little or no energy to keep its inhabitants comfortable and its larger environment unharmed. The project also offers a prototype for the development of housing where value is measured not by square footage or its investment potential, but by its contribution to the quality of life for individuals and communities. The third goal, embedded in the first two, is to make high quality design and workmanship defining features of new home construction. When Dennis asked KR+H to become involved in this project he included a broadsheet he had written about the house and the ideas behind it. This manifesto reminded me of the energy and ambition of the early modernists; the way the promotion of their ideas was as powerful and startling as their built work. I opened it up thinking that I had never worked on a house that came with a mission statement. It was splashed across two pages like a banner headline in a tabloid: IT'S NOT THE TECHNOLOGY; IT'S THE ARCHITECTURE. This takes the modernist notion that "a house is a machine for living in" and flips it on its head. The Hudson Passive Project is a prototype built on the conviction that sustainable housing must be self-sufficient, impeccably crafted, and above all capable of supporting and even enriching human experience. This last feature is critically important; houses will last for hundreds of years only if generations of users love them.